The bossa nova, meaning "new beat", appeared in the 50s and 60s and is one of the most popular Latin drum set beats you'll encounter. The rim click simulates the click of a clave. The hi-hat simulates the shaker. Alternatively, you can play the 8th notes with a brush to further simulate a shaker. The following is a simple standard bossa nova beat applied to the drum set. This beat is sometimes referred to as bossa nova 3:2 because it has 3 rim clicks in the first measure and 2 in the second. Move your right hand to other instruments. For example, the ride cymbal, grace notes on the snare. Invent your own rim click patterns. 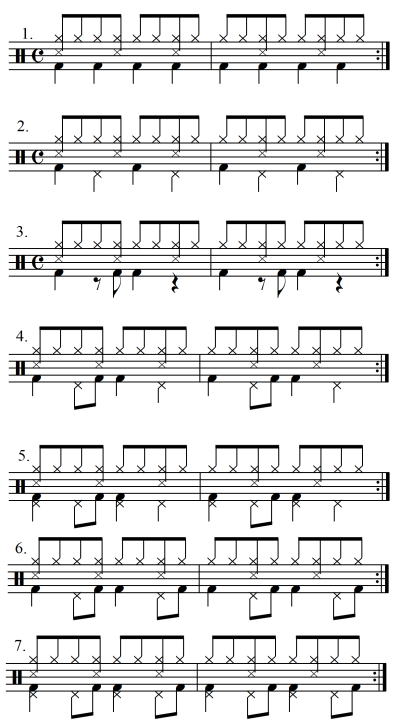 The following are some feet variations of the above standard 3:2 bossa nova beat. Although some are simpler, some are more complex, and you should learn to play all of them well. Latin fills can vary tremendously. The following video contains a few fills to get you started. "Play-drums: Latin Bossa Nova Drumset Beat"